Cabbage chili? Yeah, not something you’re likely to find in Texas. But totally worth having. Particularly since cabbage has almost no calories. Many of us are diet conscious this time of year, so that’s a winner. But the biggest winner is the flavor. We’ve loaded this dish with lots of dried chile powder and other spices, so it has all the deep chili flavor you expect from, well, chili. This dish makes a great weekday meal, but it’s good enough to serve at an informal weekend gathering with friends. Like, maybe, for football playoffs or the Super Bowl. Score! You can use any spicy sausage you like in this dish. Mexican chorizo is a natural, but any full-flavored sausage works well (we used kielbasa). Just be sure to choose a sausage with lots of flavor. Sausage is an accent element in this dish, but its flavor will stand out – and you’ll definitely be tasting it. We used dried chile powder to season this dish. You can also use chili (with an i) powder – see Notes for an explanation of the difference. We included a couple of jalapeño peppers for extra flavor. Skip those if you’re heat-adverse. We suggest using dried black-eyed peas (which don’t need soaking). They’ll cook in 45 minutes to an hour, which is perfect – you need to cook the chili at least 45 minutes in any case to develop the flavor. See Notes if you want to substitute canned beans, or another variety of bean. This recipe makes a batch large enough for a crowd – 4 to 5 quarts. But chili freezes well, so you can save some for later. Leftovers will also keep for a few days in the refrigerator if stored in an airtight container. Prep time for this recipe is 20 to 30 minutes. Cooking time adds about an hour, mostly unattended. You can make most of the dish ahead of time, then refrigerate it (prepare through Step 10). When ready to serve, just add the cabbage and cook for an additional 15 minutes (Steps 11 and 12). Sort through the dried black-eyed peas, picking out and discarding any stones or pieces of grit. Place the black-eyed peas in a large bowl, fill the bowl with water to wash them, then drain the beans. Set aside. Peel the onions and cut them into dice of about ½ inch. Set aside. Peel the garlic and mince or dice it finely. Set aside. Wash the jalapeño peppers (if using) and cut them lengthwise. Use a teaspoon to scoop out the ribs and seeds (be careful, the oil on these is hot; keep fingers away from your eyes). Chop the peppers into very small dice, or use a mini food processor (reserve a slice or two of the pepper for garnish). Set the chopped peppers aside, then wash your hands with soap and water to remove the hot jalapeño oil from your skin. Place a large cooking pot (one that holds at least 6 quarts) on medium stovetop heat. When hot, add the oil. When the oil is heated (it’ll shimmer), add the chopped onions. Season to taste with salt (about ½ teaspoon kosher salt), and sauté for 5 minutes. Meanwhile, wash the potatoes and peel them. Cut the potatoes into dice of about ½ inch. Set aside. Meanwhile, cut the sausage lengthwise into halves or quarters. Then slice across the width into pieces of about ½ inch. Set aside. After the onion has been sautéing for 5 minutes (Step 5), add the garlic and jalapeño peppers. Sauté for another minute or two. Then add the potatoes and sausage. Sauté for an additional 2 minutes. Add the chile powder, coriander, cumin, and oregano. Stir to combine, then sauté for 1 minute. Add the black-eyed peas, water, and diced tomatoes. Bring the mixture to a simmer. Taste, and add salt if necessary. Cook at a simmer for 45 minutes. Meanwhile, wash and dry the cabbage, then cut it in half (reserving one half for another use). Cut the cabbage half into half again (giving you two cabbage quarters), and remove the core. With a knife, shred the cabbage across the width of each quarter (no need to shred as finely as for coleslaw; pieces of about ½ inch will work fine). Set aside. Serve the chili. Garnish with a slice or two of jalapeño pepper, if desired. You can garnish this chili any way you like. We favor jalapeño peppers. But you could also use oyster crackers, diced raw onions, dollops of sour cream, or sprinkles of cheddar cheese. Or try some minced cilantro or parsley. What kind of chile powder to use? We like medium Hatch chile powder, but that can be hard to find (we purchase ours online). Ancho chile powder also has great taste, and is fairly mild; most supermarkets stock it these days. We use 2 tablespoons of chile powder, which produces a chili that we consider fairly mild. Increase the amount if you want spicier. Or decrease to 1 tablespoon if you don’t want much spice at all. You can substitute chili powder for chile powder in this recipe. Remember, chile (with an e) powder contains just powdered dried chiles. Chili (with an i) powder contains chile powder, but also usually includes oregano, cumin, and other flavorings. If you’re using chili powder, we suggest 3 tablespoons – although, as always, season to your taste. You might also want to reduce the cumin, coriander, and oregano by about half, or eliminate them altogether (since these flavors are already in the chili powder). We use kosher salt, which is more coarse than regular table salt. That makes it less salty by volume. If you’re substituting regular table salt for kosher, always use less – about half as much as we suggest. If the dish isn’t salty enough, you can always add more later. If you prefer to use canned black-eyed peas in this recipe, we suggest 3 cans. Drain them in a strainer, then rinse the gunk off. Add them to the dish in Step 10. Cook for 30 minutes instead of 45, then add the shredded cabbage. Want a substitute for black-eyed peas? We haven’t tried it, but we think canned garbanzo beans or kidney beans would work well (use 3 cans). Or you could use dried beans: Soak them overnight, then drain the beans and add them to the recipe in Step 10. Cook until tender – likely an hour or so. Add the cabbage when the beans are tender. “Well, not using enough sausage would be the wurst,” I said. I felt instantly warm when I saw CHILI :-)) This looks comforting and very tasty! Hi Angie, definitely a warming dish, isn't it? And this is a wonderful version! Thanks for the comment. Are you planning a Mexican Saint Patrick's Day? Corned beef instead of chorizo? This soup is just right for a rainy day with all its flavors and spices. Hi Mae, I've actually made a corned beef and cabbage soup. Never put it on the blog -- maybe I should. :-) Thanks for the comment. Hi Gerlinde, it's a great dish -- quite vibrant flavor. Thanks for the comment. What a fun and different chili. Never would have thought to use cabbage but really great idea and yeah cuts down on the calories. And lots of heat in there too with the sausage and spices. Gotta try this one soon. Hi Evelyne, yeah, cabbage isn't your typical chili ingredient. It's really good, though! Thanks for the comment. This is definitely a different version of chili and it sounds delicious! I say, the spicier, the better! Great color too! Hi Pam, isn't this fun? And it's really, really good! Thanks for the comment. Hi Gingi, that's just for garnish. Although I'd eat it! Love spicy. :-) Thanks for the comment. Love the combination of flavors here. I'd definitely give it a try although I'd have to substitute the black eyed peas...very hard to find where I live. Plenty of other beans, though! Thanks! I agree cabbage is an underrated vegetable. With all the grey and rainy days we've been having this spicy chili would be a wonderful dinner. Hi GiGi, this dish actually was our New Year's Day dish -- wanted to do something different this year. :-) Thanks for the comment. Hi Judy, the cabbage sounds weird but really works! Thanks for the comment. Hi Lydia, I'd bet garbanzo beans would be nice. Thanks for the comment. Hi Greg, black-eyed peas don't take long to cook, so I never soak them these days. And really don't soak other beans as much as I used to -- just cook the dish an hour or so longer. Thanks for the comment. Hi Deb, cabbage is good stuff! It's one of those things we almost never ate, but over the last two or so years we've grown to love it and use it all the time. Thanks for the comment. 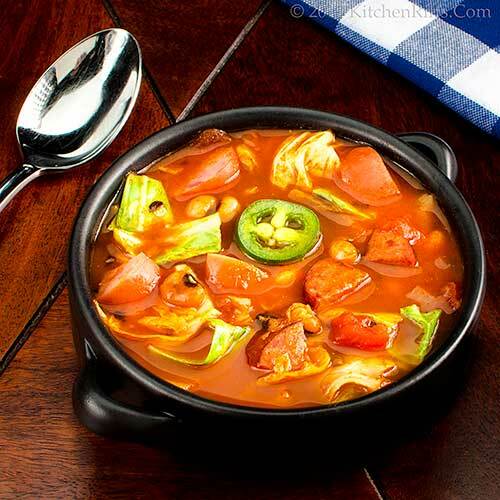 I love cabbage in soups and I also am a huge fan of adding spicy sausage to chili. You chili sounds like a winner! Hi Liz, cabbage is great in soups, isn't it? Wait until you try it in chili! Thanks for the comment. Hi Liz, this isn't great summer fare, is it? But you'll crave it in a few months! :-) Thanks for the comment. I've always loved cabbage soup so I know I would love this! It's a brilliant dish - thank you for sharing! Hi Tricia, we love cabbage soup, too. And chili of all types. So this recipe was a logical outcome of that. :-) Thanks for the comment. Oh my! something a bit spicy to warm us up on cold January days! A healthy meal with tons of flavor? Sign me up! I gotta try this light and creative chili version. So warm and comforting! Hi Peachy, it's going to be really cold here this weekend, so we'll need to make another batch! Thanks for the comment. Hi Ashley, you're signed up! :-) Thanks for the comment. Hi Denise, this really is comfort food at its finest! Thanks for the comment. Hi Merryn, we enjoy writing those conversations (and yes, we both contribute to them). I haven't tried this with red kidney beans, but they "sound" pretty good to me. Thanks for the comment. Hi John, what a unique and interesting chili, I can tell just by the way it looks it is delicious. Love the banter between you and Mrs. K. Happy 2017. Hi Cheri, we always enjoy that banter, too. :-) Thanks for the comment and Happy New Year! Hi Anne, cabbage is so versatile, isn't it? And works SO WELL in chili. Don't know why we didn't make this sooner. :-) Thanks for the comment. Cabbage is one thing I have never thought to use in chili! I do love cabbage...best get this started! Thanks John! I would never have thought to put these particular ingredients together, but now I have to wonder why. I love cabbage and I love chili. I can easily imagine that they'd be good together. What a great idea. It has been ages since I've had black-eyed peas, usually we make a beef stew with it and it is delicious. Love the addition of cabbage filling and might help shed off those pounds gained in the holiday season :). Thanks for sharing this awesome recipe. Hi Abbe, cabbage sounds weird in chili but tastes wonderful. So, winner. :-) Thanks for the comment. Hi Jeff, bet you'll love this! And there are so many different combos of beans and sausage that you can try. Thanks for the comment. Hi Amira, blacked-eyed peas go with so many things, don't they? We love them! Thanks for the comment. Hi Bobbi, your boys will love this! And it is a way to "sneak" veggies. :-) Thanks for the comment. Oh, you could invite me to this delicious meal. Or better, I will make it myself! Great recipe, thanks. Hi Cecilia, you'd be welcome! :-) Thanks for the comment. A black-eyed pea chili! Love it! So very creative and another fabulous way to use black-eyes. They are so underrated and I love them. Thanks for sharing John! Hi MJ, we love black-eyed peas! And they go SO well with cabbage. Or any green, really. Thanks for the comment. Hi Natalia, you can do so much with cabbage, can't you? We don't use it enough in this country -- and I'll bet at least half of what we use goes into coleslaw -- but it's really a wonderful ingredient. Thanks for the comment. Hi Mary, it's really soup/chili weather here today -- we're having an ice storm! Not. Going. Out. :-) Thanks for the comment. I love a lightened up dish and this is so creative making cabbage the star. Thank you for the explanation of chili versus chile powder. I did not know the difference. Hi Laura, cabbage is amazing in chili! Works really well -- loads of flavor. Thanks for the comment. It has been far too chilly over here--guess we need some chili! This looks perfect, warm and toasty. Thanks, John! Hi Ala, chili is just the prescription for chilly weather. :-) Thanks for the comment. I was sweating before I got here and after looking at your chili, it's gotten a few degrees warmer. :) Maybe I could make some and eat it while I sit in the pool?? It looks really inviting. Hi Maureen, you know they say spicy food in a hot climate cools you off. So maybe make this extra spicy? :-) Thanks for the comment. Hi Frank, we've got freezing rain today and I have some cabbage in the refrigerator. Think I should make another batch? :-) Thanks for the comment. Hi Debra, the sausage and black-eyed peas of course add calories, but the whole dish has much less than regular chili! Thanks for the comment. This chili looks fantastic! I really enjoy cabbage and like to find new ways to use it in dishes. Hi Amy, cabbage is great, isn't it? We love using it in new dishes, too! Thanks for the comment. Sound like a perfect comfort dish for a cold night. Love the flavours on this. Hi Raymund, it's been cold here lately,so we've been enjoying this! Thanks for the comment, and Happy New Year! Hi Nami, isn't this fun? And really good! Thanks for the comment, and Happy New Year! Hi Carolyn, cabbage really isn't used enough, is it? For most people, mainly in coleslaw. Which is good, but you can do so much more with it! Like make chili. :-) Thanks for the comment. This is my first time ever hearing of a Cabbage chili and I'm not only fascinated but drooling too! 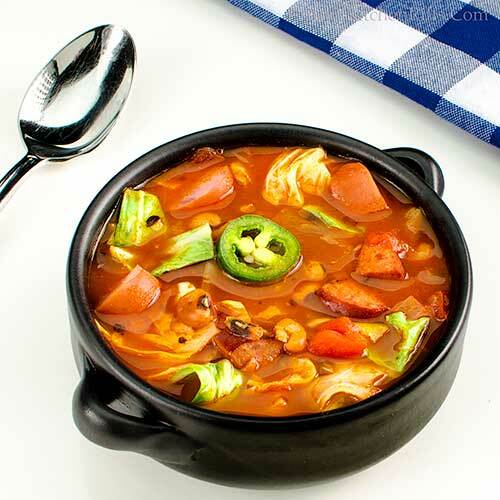 Yay for a lower calorie chili and so loving the flavor from the Mexican Chorizo in this! Perfect for starting off the new year on a healthier note! Hi Shashi, this is fun chili! The cabbage is GOOD. And it's fun experimenting with different sausages (although chorizo is probably the best, every type we tried worked really well). Thanks for the comment. Hearty, filling, comforting. Looks great to me! Hi Pam, it IS great. :-) Thanks for the comment. Hi Anu, we had an ice storm this past weekend, so were happy to have some of this to warm us up! Thanks for the comment. Hi Claudia, this will definitely definitely warm you up enough that it feels like a thaw, even if the weather doesn't cooperate. :-) Thanks for the comment. 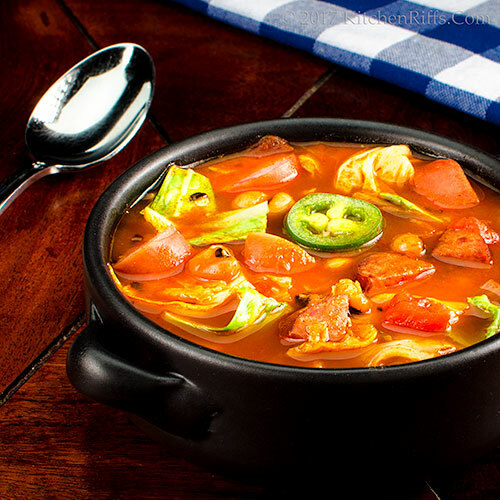 I have never heard of cabbage chili...and I am loving it...somehow I do not cook cabbage very often, and this would be a great way to use...especially in cold weather like now...I love adding spicy sausages in soup...yum! Hi Juliana, it occurred to us a few years ago that we used very little cabbage, so we've been making an effort to use more of it. It's such a great veggie -- super flavor, and very healthy. Thanks for the comment. Never tried cabbage in Chili. Sounds and looks perfect for the cold weather! Hi Shibi, I know cabbage in chili sounds odd, but it really works! You'd like it, I think. :-) Thanks for the comment. I am ridiculously behind visiting everyone, John, but somehow in the quagmire known as my inbox, this post caught my eye. Earlier today, I walked into a grocery and they were running a sale on cabbage. I remembered this recipe, pulled it up on my smartphone, and went shopping. I've not made it yet but will over the next day or so. I'm looking forward to it, cabbage soup lover that I am. Thanks for sharing another great one, John. 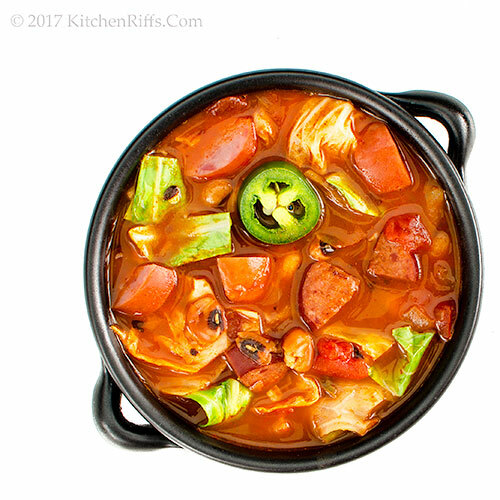 Hi John, this actually started out as cabbage soup until I decided to go in a chili direction. It's really good -- I think you'll really enjoy this. :-) Thanks for the comment. Hi John, delighted you got to try this! And obviously delighted you enjoyed it. I thought you would. :-) Thanks for the Facebook link love! Yes I am so going to try this. I actually added some cabbage to my chili last time I made it but I chopped it too fine so it sorted melted away. The spicy sausage sounds delicious as well. Thanks John! Hi Yi, cabbage in chili works really well, doesn't it? It might be fun to try this with Chinese sausage -- I think that'd work. :-) Thanks for the comment.